One of the most beautiful, romantic and mysterious ruins in New York’s Hudson Valley lie on public land in the Hudson Highlands State Park. This is the Edward J. Cornish estate, outside Cold Spring, NY. 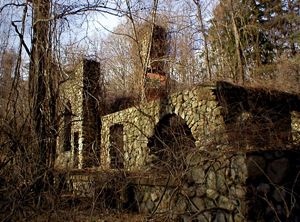 Like a North American Macchu-Pichu, the stone ruins of the Cornish mansion and out buildings are in the process of being swallowed by the forest. The buildings, clearly visible in winter, become lost in the dense vegetation by mid-summer, only to be uncovered again by late fall. Each year the forest claims a bit more. What follows are a series of images taken in four seasons, each season producing a collection of very different vistas.